I have to admit, I’m late to the food truck craze sweeping Orlando and other cities like Chicago, NY, LA, etc. There are lots of fine food trucks in our city. It was a tough decision on which truck to start with. But I eventually started my new street food adventure with Korean BBQ Taco Box. They are usually located on East Colonial Dr/50 during the day, in a gas station parking lot. Back to that in a few. This being my first experience with a food truck, I didn’t really know what to expect. I was surprised to learn that I had to wait for my food to be prepared, about 10 minutes or so. I asked the attendant what to go with. He asked if I like spicy. I said yes. He suggested the spicy pork taco box. I was expecting several tacos. I got one full size taco with a bbq chicken wing and a small piece of an egg roll and other Korean sides. The taco was fantastic with the semi sweet spicy tangy flavored marinated pork inside the soft taco. I was not impressed with the chicken wing that came with it, too much hassle to deal with standing up or eating a chicken wing in your car. Could of eaten another taco, yes it was that good. Another day I also tried the chicken teriyaki taco. It did not disappoint, quite delish, chicken was up seasoned well, overall good taco. Price range for Korean BBQ Taco Box is $6-$10. Back to my remark about the gas station. I tried to order a drink from the BBQ Taco Box truck and the guy stated they did not have drinks and it was best for me to walk inside the gas station and purchase my drink there. So I placed my order with him, walked over the gas station and waited for my order. I was the only customer there, and it still took a good 10 min plus to process my order. I assume all orders are cooked to order. Well, my first food truck experience was good. Can’t wait to try another in the Orlando area. 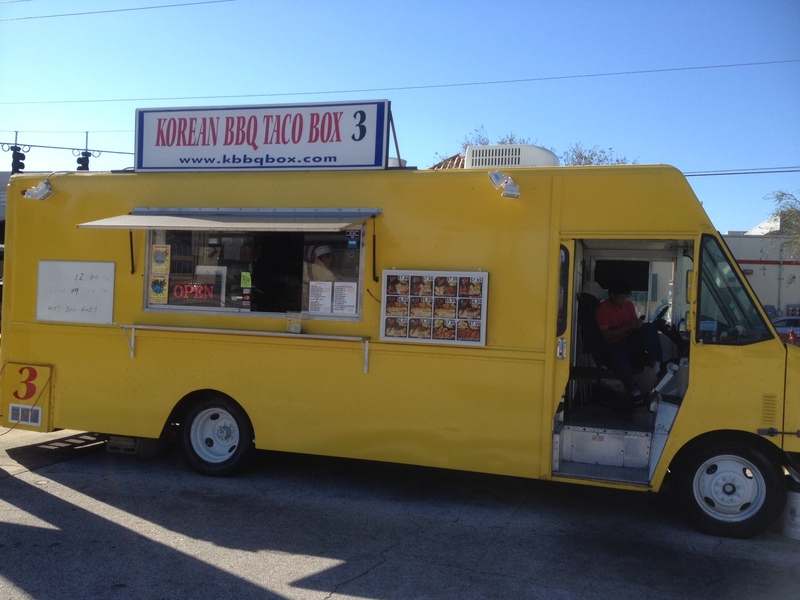 Check them out on social media at Korean BBQ Taco Box’s twitter account for locations on where and when they will be. Enjoy eating!